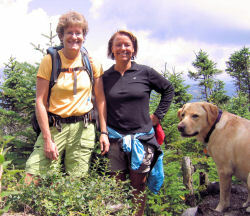 Nancy and I take a day off so we can squeeze in a hike, weekend time being less available right now. We leave Keene at 5 a.m. and head north. After passing the Henniker exit we see a black bear cross the road about 50 yards in front of us. Hard to believe - like a huge black ghost - no one sees it but us. We make our usual pit stops, including buying our favorite Lost Pilgrim sandwich at the Mountain Bean. We arrive at the Nancy Brook trailhead a little after 8 a.m. No cars in the lot. We load our gear, let Dejah (Nancy's daughter's 2 and a half year old yellow lab) out of the car, and off we go at 8:17 a.m. The first mile or so of the trail is an old logging road, wide enough for the two of us to walk abreast. The cool air and the quality of the late summer light makes me so aware of the changing season. I struggle with the change, especially in August and September. By October I've given up and stop fighting the fact that fall is coming, ready or not. The bunch berry leaves are starting to turn brown at the edges. No more spring bird songs. 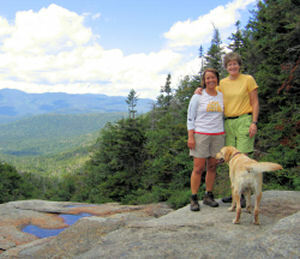 The trail is beautiful, especially after we leave the logging road and start to parallel Nancy Brook. The Nancy Cascades are spectacular with the morning light glinting off the upper reaches of the waterfall. Once we pass the cascades, the trail starts to get steeper - winding up the ravine next to the Brook until we hit a more level ridge. Shortly afterward we come to a small clearing and see the east end of Nancy Pond. What a beautiful pond - a bit brackish, but pristine in that there is no sign of human presence. I hope to see some wildlife, but all we see is a lone female duck swimming across the pond. Half a mile later we reach the east end of Norcross Pond, a bit bigger than Nancy Pond, and just as beautiful. At the west end there is a No Camping sign and the summit path is at 4 o'clock behind your shoulder when facing the sign. Walk into a little clearing and take the left fork - we are lucky and had done some research. We would never have known which path to take without reading someone else's trip report. Before heading to the summit we walk to the beaver dam at the end of the pond and find a rocky sluice where the water drains. 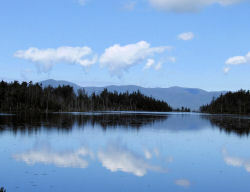 We sit there and eat our lunch with the most spectacular view of Zealand and the Bonds and the Pemigewasset wilderness laid out before us. At 11:40 a.m. we start up the herd path to the Nancy summit. Ok, now anyone who says the hundred highest is a list wimpy of mountains has not climbed Nancy. Wow - what a steep, relentless half mile that is. Good stuff though, breathing hard, feeling our calves scream, sweating. When the trail levels out a bit, I know I have burned some fat cells. Yes, indeed. We hit the view spot at 12:22 p.m., take some pictures, and look for the yellow canister to no avail. We see nothing. I am bummed. I want to sign the register, but it is not to be. We take a last look and start down the trail at 12:40 p.m. Interesting descent with wet roots on the path every inch of the way. We arrive back at the Nancy Brook Trail at 1:05 p.m. and spend a very pleasant couple of hours backtracking to the parking lot. I am amazed at how different the trail looked in the afternoon light than it did in the morning light. We arrive back at the trailhead at 4 p.m. This is a beautiful hike, with ponds and waterfalls, and views and a steep summit hike thrown in. A perfect day. BEAUTIFUL: The Nancy Cascades were majestic, beautiful, inviting, gorgeous take-your-breath-away water falls. The clear water cascades over a rock ledge 360 feet into a small pool at the bottom. 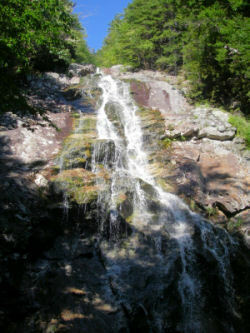 The falls are named for a servant woman who perished trying to reach her fiance's camp in the White Mountains one winter. A bit later in the hike we came across Nancy and Norcross Ponds, just what you would picture secluded wilderness ponds to look like - but the peacefulness and quiet of the scene made me pause with its power. Seeing not a ripple in the water calmed me, made me walk slower and appreciate more. And then our lunch spot sitting on warm rocks at the dam looking out at the blue mountains in the distance was idyllic. Checking the map we realized we were looking at the Bonds - the 20-mile-killer-hike we did last summer. I could have sat there all day being amazed and thankful for what lay before me. All this beauty and we had not even reached the summit. Nancy reminded me that the beauty is not just at the top it is also in the journey to get there. NOT WIMPY: The second gift from Nancy was the steepness of the last half-mile up the mountain which Pat talked about in her report. Just when I think I have seen the steepest of steep, I come across a doozy of a trail that beats my previous definition. Not even an official trail, the herd path to the summit of Nancy now tops my steep list. Wowsers! It was like the Mountain Gods tied a cable to the last half mile of the mountain and pulled straight up with all their might, making the mountaintop skinnier, taller and very steep instead of fatter and more gradual. I'm sure they did it just to remind us that the 100-highest are not, as Pat said, wimpy. Then the Mountain Gods made sure the herd path was lined with trees so we human hikers could use them to pull ourselves up the trail, holding on for dear life, and to brace ourselves, as we skid down the mountain, struggling to stay on our feet and off our butts. FUN IN THE MOMENT: The final and most precious gift from Nancy was the reminder to follow my heart. When we hiked back down the mountain to the Nancy Cascades, the mountains spirited playground, my inner kid was screaming to get into the little moat at the bottom of the Cascades and put my sweat-soaked head under the falling water. Whooo Hooooo! But I didn't. I manufactured an excuse inside, saying to myself that it would be crazy and not adult hiker-like, that I would get cold, that Pat wouldn't want to, that it would waste time. WHAT WAS I THINKING? It was my chance and I let it slip away. What I am sure of is that if I follow my heart I will be really living in that moment. So I pledge to myself that the next time my inner child starts screaming she wants to do something, I will follow my heart and do what she suggests. You will all hear about it - I promise! So in the end, Nancy, my namesake mountain, reminded me of me, if I can let myself see the similarities and own them... beautiful, not wimpy, and fun.